I wish I had found this months ago...the perfect Christmas present (for myself)! I was searching for a pendant/tag that I had seen a while ago on Etsy that was an oval medallion with "Beans" written on it & the impression of 3 little beans. I loved it immediately and wanted to get it for Ana to wear (we call her Ana-beans, or just Beans for short), but it was $50. Well, I am working on a segment for my Greyhound Threads blog called "12 Dog Days of Christmas" where I will be counting down the days until Christmas by sharing the items on the pups' wish list (believe me, it is LENGTHY! ), so I was looking for this particular charm. Of course, in my excitment over finding it, I neglected to save it as a favorite, and have been unable to find it again. But, as I was searching for this elusive tag, I found the most perfect necklace & pendant! I initially found it on an antique shop online (for about $125 beans), but when I checked directly with Tiffany & Co.'s website, they still make it! I need to go in person to check on the sizes because I can't really get a good feel for it online (and also because it looks like the vintage pieces were sold as "mini, medium and large" instead of "9mm, 12mm, 14 mm, 18mm & 20mm"). But I love it. 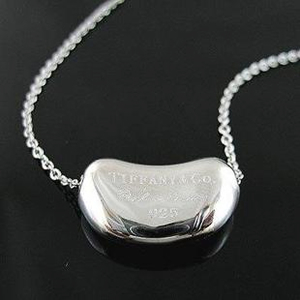 Not just because it's a piece from Tiffany's (don't most girls swoon over Tiffany's jewelry?? ), but because of all it symbolizes. The bean represents the origin of all things (at least, according to Tiffany & Co.). I immediately felt drawn to this necklace, initially as a method for commemorating my little Bunny-beans (yep, another version of the nickname), but as soon as I read "origin of all things" I realized it would be so much more. It would be the reminder of how a life-long love of greyhounds began...and a commemoration of all the firsts that have come along with it. From the very first greyhound we ever met (Jason & Trina's Dana), to the very first greyhound we ever adopted (Ana, the bean), to our very first boy (Blue, our Blue-baroo), to the first time the pups realized how to play with toys, to our first time helping with a greyhound haul...the list could keep on going. In an instant, this bean necklace suddenly became very important to me...and I can't wait to get it. Maybe not for Christmas, since all the gift-givers are close to being done with their shopping, but someday. Someday, I'll have that tiny little blue box to open, and that will be a first, too...just like the bean represents. "Say, isn't that an Elsa Peretti necklace you're wearing?" Her eyes all a glitter, I knew I was screwed. Why couldn't I keep my mouth shut? Why did I have to let her know that I actually knew something about Tiffany? With her birthday rapidly approaching, I now knew that there was no way I could give her anything less than that damn little blue box. Why, why, why couldn't I keep my thoughts to myself?! 1) This is the toughest part... pay attention to what your wife, girlfriend, or mistress has to say. They actually drop these things called "hints". "Hints" are phrases that indicate things she wants. I know, who would have guessed it? 2) With "hint" in hand go to http://tiffany.com, find the item she is hinting about... memorize it, or better yet write it down on a piece of paper. 3) Go to Tiffany with your piece of paper. You will be greeted by numerous staff that will try you to disarm you into spending your life savings by saying disarming things like "hello" and "how are you today?". Listen to them at your own peril. 5) They will nicely tell you Elsa Peretti is on the second floor (If your item is on the first floor, you have my condolences). Upon seeing your deer in the headlights look, they will gently point you towards the stairs. 6) When you get to the second floor you will again be greeted by more staff, "Elsa Peretti necklace with the beanie thingy on it" you yell, your voice raising in pitch. 7) Several minutes later they will show you to the door with your precious little blue box in hand. 8) Find a nearby bar, you have earned it.